Tag line: "The 1920 Horror Masterpiece"
The Golem (subtitled How He Came Into the World) was actually the third film to feature its title character, a 16th-century monster made of clay whose primary purpose was to protect the Jewish community. 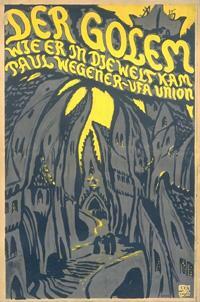 Like the previous movies (1915’s The Golem and the 1917 short comedy The Golem and the Dancing Girl), Paul Wegener (who also co-wrote the screenplay for this movie and shared directing duties with Carl Boese) appears as the dreaded Golem, and while some aspects of this 1920 movie may prove troublesome for modern audiences, The Golem nonetheless stands with The Cabinet of Dr. Caligari as one of the best examples of the German Expressionist Movement. While gazing at the stars, Rabbi Loew (Albert Steinrück), the spiritual leader of the Jewish Ghetto in Prague, determines that his people are in for some bad times. Sure enough, the very next day, the Emperor (Otto Gebühr) issues an edict ordering the Jews to vacate the Ghetto, forcing them out of the only home most of them have ever known. Shortly after reading the edict, which was delivered by a knight named Florian (Lothar Müthel), the Rabbi constructs a Golem (Wegener), a large humanoid creature made entirely of clay, which, according to his books, will help protect his people from their enemies. During a ritual, Rabbi Loew summons the demon Astaroth, who assists him in bringing the Golem to life. The Emperor does eventually change his mind, and agrees to let the Jews remain in the ghetto. But when Florian falls in love with the Rabbi’s daughter Miriam (Lyda Salmonova), the Golem is called into service, leading to a series of catastrophes that threaten to destroy the Ghetto and everyone in it. The Golem is certainly not a perfect movie; the story is a bit sluggish at times, and truth be told, the title creature isn’t all that frightening (the film’s creepiest scene, when Rabbi Loew conjures up the demon Astaroth, doesn’t even feature the Golem). What the film does have, however, are some amazing set pieces (the Ghetto, designed by architect Hans Poelzig, was built from scratch) that, with their sharp angles and bizarre fixtures, helped define German Expressionism. And with camerawork by the great Karl Freund (who, along with shooting 1931’s Dracula, was the director of the original Mummy film), The Golem is, from start to finish, an absolute visual feast. Though not as well-known as either The Cabinet of Dr. Caligari or Nosferatu, The Golem deserves a place of honor alongside them, and any fan of classic horror should definitely check it out.